Better Buy: Textainer Group Holdings Limited vs. Frontline Ltd. In this matchup of two companies in the global shipping business, we try to determine which provides a better value investment for the investor. Looking for value plays within industries facing headwinds isn't the easiest way to invest, but the exercise can reward richly if you're both right and patient. Let's set up a head-to-head comparison of two corporations that have been battered by inclement weather in the maritime shipping business: Textainer Group Holdings Limited (NYSE:TGH) and Frontline Ltd. (NYSE:FRO). Both offer attractive investment characteristics while entailing some risk, as well. Which is the worthier vessel to add to your portfolio? Frontline, which merged with former spin-off Frontline 2012 in November 2015, operates a fleet of 88 vessels, including very-large crude carriers (VLCCs), Suezmax tankers, and clean-product tankers. Out of this total, 60 are currently operating, and the remaining 28 are under construction in the company's newbuilding program. Textainer Group leases, manages, and sells shipping containers to an international customer base. The great majority of the company's revenue is from leasing: Container-lease revenue accounted for about 94% of total revenue last year. Both companies must treat industry-specific pressures. Frontline is faced with industry-wide tanker overcapacity, due to an ambitious vessel buildup among competitors in the last several years. This tends to pressure vessel charter rates, which, after a decent 2015, have declined in the first half of 2016. Textainer is attempting to parry the effects of a dip in world trade, and consequently, the container business. Company management recently pointed out that the growth in the global container trade last year of 1% lagged global GDP growth, estimated at 3%. It's only the second time trade growth has lagged GDP growth in more than 37 years. All dollar figures in millions. TTM = Trailing 12 Months. Balance sheet figures from latest quarterly reports. Sources: Company SEC Filings, Ycharts. We can see that the companies have generated similar revenue over the last trailing 12 months, but that Frontline has enjoyed a much-higher operating margin than Textainer. Textainer gets high marks for its vigorous operating cash flow, as well as its current ratio -- a measure of liquidity. However, Textainer has a higher relative debt load than Frontline, and less of a cushion in the ability of earnings to cover debt service, as seen in its weaker "Times interest earned" ratio. 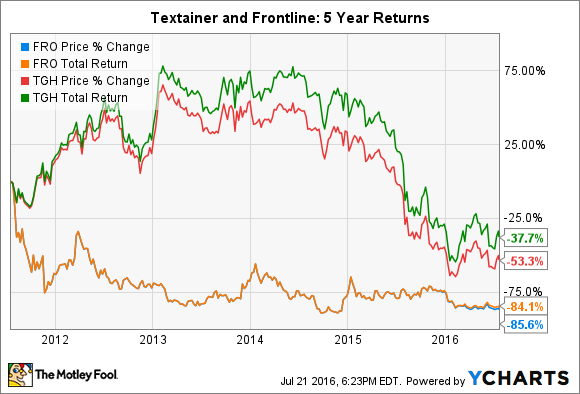 To be fair to Textainer, it's outperformed Frontline as an equity investment over the last five years. Both companies have lost ground as global GDP has decelerated and crimped the shipping industry's prospects. Now that Frontline has merged again with Frontline 2012, the combined company has begun paying a fairly substantial dividend, beginning with the fourth quarter of 2015. Based on the latest declaration, Frontline's dividend currently yields 19%. Textainer is also paying out an extremely attractive dividend, yielding nearly 8%. These payouts are, in some way, an enticement to investors who may be scared off by the cyclicality of the shipping business. The yields are high due to the low forward valuations of each company -- once both tickers begin to recover, of course, yields will decline. As it is, Textainer's dividend payout ratio -- that is, its dividend payments divided by net income -- seems quite high at 118.5%. But due to its high cash flow relative to revenue, the dividend is probably sustainable. Textainer's CEO, Phil Brewer, recently made the following point regarding the container trade versus ownership of vessels: "The world's container supply is under control, unlike the excess vessel capacity affecting the shipping lines. When trade picks up, container demand could increase rapidly." While this may be generally true, Frontline has carefully controlled its fleet capacity. Its newbuilding program, while a substantial portion of total fleet, has been put in place to ensure that the company can modernize its assets and retire older vessels in the next few years. In addition, while container supply may be under control, it may not reach a state of high demand in the near future. As trade slows, new and used container prices have been falling. Textainer's management disclosed in its most recent earnings call that used container prices have deflated in the range of 25%-30% recently. The company cited $17.3 million of impairments on its container inventory valuation as a factor behind underperformance in Q1 2016. Considering all factors, Frontline appears to be the better buy, at present. It's less burdened by debt, and moreover, has a reinstated dividend made possible by its merger, which will bolster its total returns going forward. Both companies are positioned to do well if shipping activity accelerates. Each has acceptable profit margins, and present a value proposition due to the discount investors currently apply to shipping-industry stocks. Yet Frontline appears to offer a better margin of safety for the investor, and a higher return potential.